Recently, I was having trouble with my indoor/outdoor weather station, and I thought low battery power in the outdoor unit might have been the problem. A computer reminder triggers routine preemptive changing of the batteries so that corrosion doesn’t damage the unit. The reminder still had a few months to go, but it has been such a brutally cold winter, I thought the batteries might have aged prematurely. As it turned out, that wasn’t the problem, which left me with a dilemma: what do I do with these batteries that are probably still good? Now, the last thing I wanted to do was put them in something that might be destroyed by them. Still, several options existed. I needed to use a device that would tell me when the batteries were dead, and wouldn’t get missed, allowing the corrosion to ruin the device. My first thought was a clock. Or clocks. I have several in the garage, so I’m never far from knowing the time. I like staying on schedule, and, even on my time off, my activities are pretty regimented. When a clock with a second hand goes dead, it’s pretty obvious. 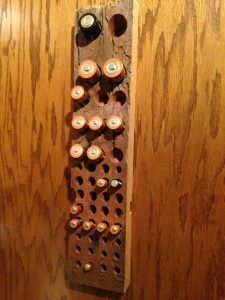 Another option was the garage stairs “dinger.” It’s the alert system I use to let me know when visitors are coming down the stairs, a safety system that prevents me from being startled while operating machinery. I’d hate for the table saw blade to spew blood all over company. Then came another question, “What do I do with these batteries while I’m waiting for them to be used?” I’d have to come up with a storage system. 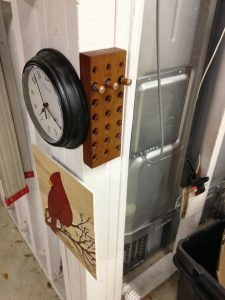 I made this battery storage for our laundry room. Someday, I should put some finish on it. A couple of coats of varnish would look nice. Of course, to keep the project cheap, I chose a scrap piece of wood. My first thought was to use treated pine, but I considered that the chemicals might be corrosive to the batteries or their intended device. The slab needs to be at least 1-1⁄2″ thick to provide sufficient hole depth to prevent the batteries from falling out on their own, or if vibrations shake the wall. Step two was to decide on a good angle. The Woodpecker’s 12-in-1 Tool says 10i worked well on the previous holder. 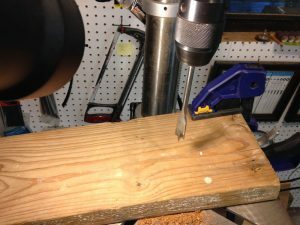 Set the drill press table to 10i with a support you can drill into if necessary. 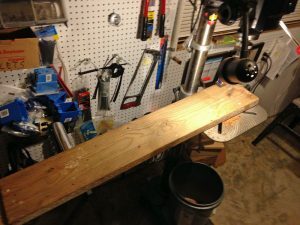 I wanted a long board to support the entire project length. A sharp Forstner bit makes a clean hole with a flat bottom. 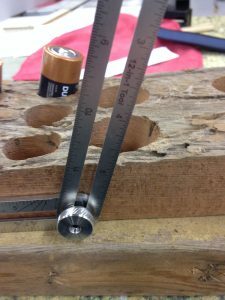 Take the holes to a depth of 1-1/4” for all sizes except D, which needs full-thickness. 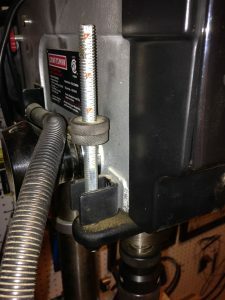 The depth stop makes for quick and accurate work. 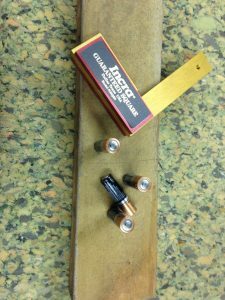 Use 7/16″ diameter for AAA batteries, 5/8″ for AA, 1″ for C and 1-3/8″ for D. You can chisel a rectangular hole for 9-volt batteries, or they will fit in a 1-3/8″ round hole. 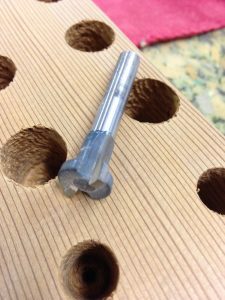 If there are sizes for which you have no Forstner bit, a spade bit will do, but the hole might not be quite as pretty. 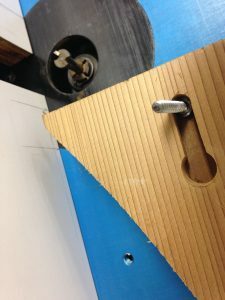 A keyhole bit in the router table makes for an elegant, hidden mounting method. And, the final product, a miniature of the original, right next to one of the clocks its batteries will one day electrify.